One of the lessons being learned as we navigate the current crisis related to illicit drug overdoses and deaths is an appreciation of the extent to which the existing system of services for people who use substances falls short of meeting their needs. Reducing the stigma of substance use and building capacity in patient-oriented primary care research, aka the Reducing Stigma in Primary Care project, brings together people who use or have used substances, academic researchers, physicians, and health planners to develop a model of safe primary care for this population. Key partners are the SOLID Outreach Society, Umbrella Society, Royal Roads University, Victoria Divisions of Family Practice and the Vancouver Island Health Authority. We know from past research that people who use substances will often delay or avoid going to the doctor when they experience health problems, for fear of being judged, turned away, or treated badly. Timely healthcare, particularly primary care, is critical to promoting health and preventing more severe health problems down the road. People who use/used substances were (and continue to be) involved in all phases of the research. 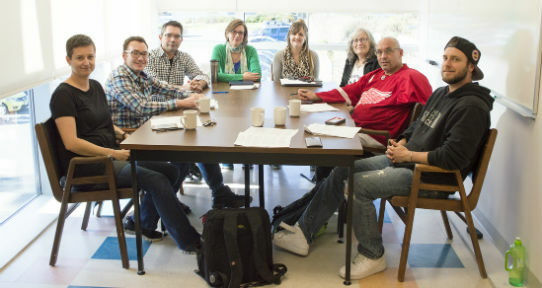 Taking on the role of community researchers, members of SOLID Outreach Society and Umbrella Society facilitated focus groups with a total of 75 of their peers who live in the Victoria area. Together, community and academic researchers analysed data and created a map of what would make people who use substances feel safe to go the doctor. Focus groups identified eight key themes that would make people who use substances feel safe to go the doctor. 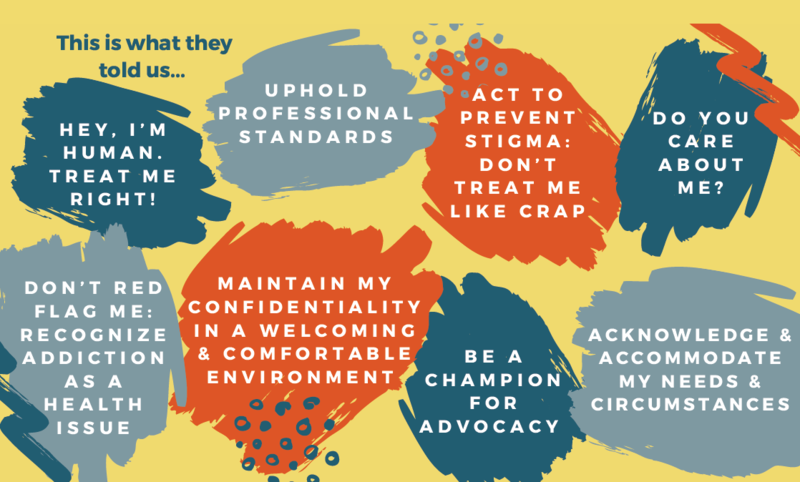 The map is comprised of eight themes: Hey, I’m human, treat me right; Live up to professional standards; Act to prevent stigma: don’t treat me like crap; Do you care about me? ; Don’t red flag me: recognize addiction as a health issue; Maintain my confidentiality in a welcoming and comfortable environment; Be a champion for advocacy; and Acknowledge and accommodate patient needs and circumstances. The community and academic researchers are now meeting regularly with physicians and health planners to discuss how these themes can be used to improve primary care. Events have been planned with physician groups and quality care councils regionally in order to share and create plans to implement these findings. Progress to date: We have completed data collection and are creating products to share findings from this project. To date, we have created a post-card that summarizes the model of culturally safe primary care, and have conducted a number of presentations with varied audiences of physicians, nurses, policy makers, researchers, and the general public.